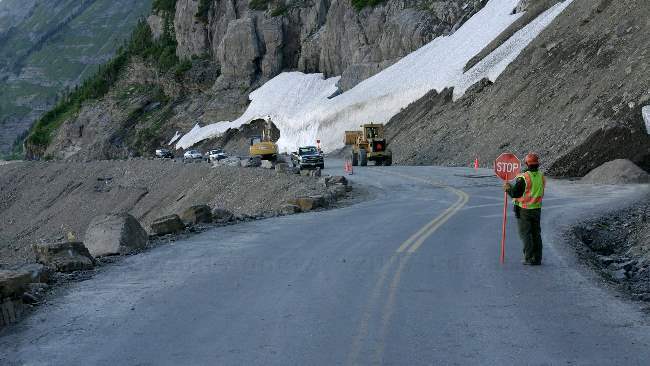 Today we were going to finish driving the "Going-To-The-Sun Road" so we were up early and off early --- the literature warned that it could get busy up at Logan's Pass (the highest point on the road). When we left the parking lot around 1pm we had someone stop and ask if we were leaving as they had been looking for a parking spot for ten minutes. After walking around the visitor center area we headed out to Hidden Lake overlook, a mile and a half trail made a lot more interesting by the snow that covered a large portion of the trail. On the drive to Logan's Pass we stopped to look at Wild Goose Island --- the little island in Lake Mary was named for some Canada Geese found on it. Another stop was to view Jackson Glacier. The road was open but there was still work to be done. You could see the remains of slides and missing road done by the winter storm when you drove near Logan's Pass on the "Going-To-The-Sun Road". The meadow at Logan's Pass was filled with Glacier Lilies. The trail to Hidden Lake overlook --- we were glad we were early as there weren't very many people about though it did make following the trail a little harder. Almost there. This handsome old goat did Zaph's job and posed for us. Made it .... and it was worth it. The view was unbelievable. On our hike down we noticed some people hiking up the snow covered hill in the middle of the photo --- they were packing skis. We waited hoping to watch them ski down but they disappeared over the top probably to ski down the other side. and the rare snow boarder. An Osprey nest at the visitor information center in St. Mary.